Meiwa the world’s largest and best manufacturer of decorative Window Films in the world, Meiwa, Japan, we bring you the most exquisite and unique window films that enhance the aesthetics of every room and also block out heat and view from outside so that the room stay cool, comfortable, private and of course classy. Sure, these marvels of science give life a new look of luxury. 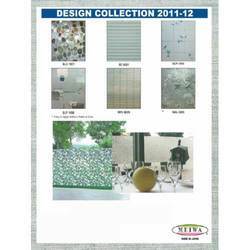 This Window Film provided by us in the market is used for the purpose of decorating and modifying window panes. The film with its beauty, provides a luxurious touch to the window. The offered product is procured by us from some of our highly trusted vendors, who never compromise with the quality they are providing. Further the product is light weighted and does not require any additional glue for the purpose of putting it on. This highly attractive Decorative Film provided by us in the market, increases the beauty of the window panes and makes the pane opaque. We, being one of the leading suppliers of this product provide safe and timely delivery. Made available in the market by us in several specifications, and at a price which is quite competitive, the film is highly asked for in the market. Further, this product is appreciated in the market for its light weight and easy application. Being one of the leading suppliers and traders of these Designer Window Films, we provide them to our clients in several designs. These offered films are known for their feature of making window panes beautiful, attractive, and opaque. These are further known for its easy application and light weight. Made available to our clients at a very reasonable rate, these quality products are one of the most preferred products in the market. We acquire them from trusted vendors, who consider quality to be their priority. Known in the market for the luxurious touch it provides to the window panes, this Window Film is very much appreciated and preferred in the market. It further makes the panes opaque, increasing the level of privacy. 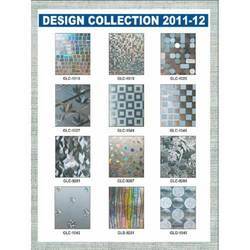 The offered product is provided by us in the market in several designs. The offered film is quite light weighted and is quite easy to put up, with no requirement of glue. 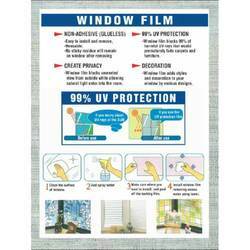 Looking for Window Film ?